Jamie Belinne, center, receives the NACE 2012 Professional Change-Maker Award. Many students at the University of Houston C. T. Bauer College of Business are on a non-traditional path. They commute to campus. They juggle work and family responsibilities with class and study time. As a result, squeezing in an internship or leadership activity is not an option for many. But thanks to an innovative new program instituted by Jamie Belinne, Bauer’s assistant dean for career services at the Rockwell Career Center, students in the college’s required “Connecting Bauer to Business” course can work on a corporate project that functions like a mini internship. 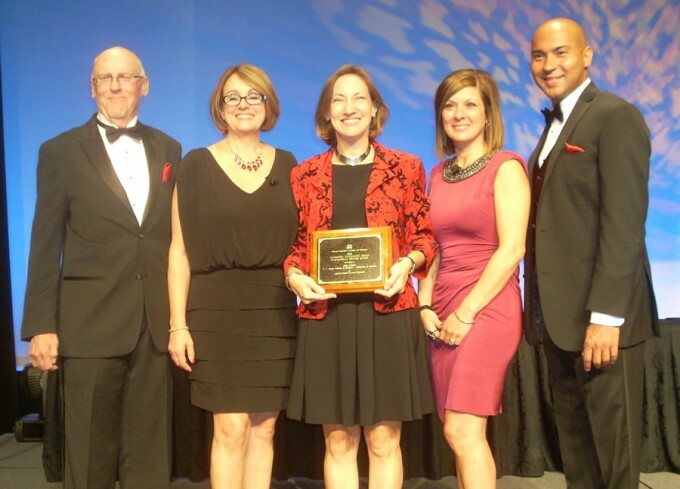 Belinne’s peers at the National Association of Colleges and Employers (NACE) were so impressed by her initiative that they honored her with a prestigious 2012 NACE Innovation Excellence Award. Belinne received the coveted Professional Change-Maker Award at a glitzy black-tie ceremony in Las Vegas on June 12. Launched on a small, experimental scale in 2009 with 24 participating companies, Belinne’s program has ballooned into a game-changing opportunity for 400 students who work on a group project with 50 employer sponsors each year. The integrative experience gives students invaluable real-world exposure that transforms the lecture-hall format. When Belinne arrived at UH from the University of Texas at Austin in 2005, she inherited a Career Services department that offered counseling but no recruitment opportunities. Under her watch, Rockwell Career Center’s full-time staff has grown from five to 18 (plus part-timers), and the list of potential employers has jumped from 300 to 4,000. When Michael J. Cemo Hall was completed in 2010, its entire second floor was dedicated to the Rockwell Career Center. Belinne holds a degree in public relations from Louisiana State University and a master’s in mental health counseling from Loyola University. Outside the university, the mother of two is a go-getter and a competitive athlete. She’s an Ironman, a certified running coach and was a Team USA member at the 2009 and 2011 International Triathlon Union’s World Championships. Now she’s looking forward to spreading the gospel about connecting students to businesses. Many well-deserved congratulations, Jamie. As both an almunus and a recruiter, this type of work will help ensure continued national recognition for Bauer and for UH. This is what makes me proud to say I am a University of Houston Cougar. Congrats! Jamie, it will be hard to keep up with you, especially being an iron woman competor! Cougar Alums appreciate your hard work!